The Display Bowl is a simple, low cost method of turning your customer queue barriers into an amazingly effective merchandising fixture. The bowl is fitted with an adapter that allows you to simply slip the bowl onto the top of the barrier; adapters are available to fit all major barrier brands, including Queue Solutions’ QueueMaster and QueuePro product lines. 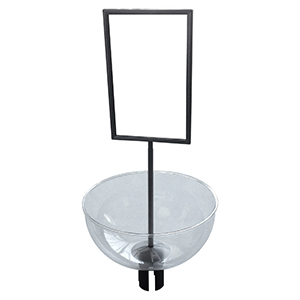 Made from tough, crystal clear polycarbonate, the Display Bowl is an ideal fixture for those small items suited to the impulse buy environment on the checkout line.